Alka Singh (Kangana Ranaut) is a dacoit/politician of Chambal. She has swagger, a never-seen-before badassery, and she is a tigress in bed. She also has a boy-toy called Rohan (Vir Das) for whom she produces films to establish him in Bollywood. A complete role reversal of bollywood clichés, eh? All the film needed was solid writing to flesh out this interesting premise. Alas, once again bollywood lets us down. Revolver Rani has one of the best opening credits in a long time. The beginning is interesting too but soon we realise that the film is all about a few good scenes interspersed between long periods of boredom. Bizarre scenarios are used to cover up for the lack of a proper story and it works to an extent. There are some truly hilarious sequences like the newsreader’s frequent use of film song lyrics, the many stage-weddings of Rohan, the Chambal Dud (dude?) contest organised by an underwear brand. Director Sai Kabir gets the lingo and the heartland atmosphere right. However, he couldn’t bring it all together as an engaging film. Most of the characters are either caricatures or under-written, and there isn’t much of a story to tell. The actors try their best and they are the ones who salvage this mess to an extent. 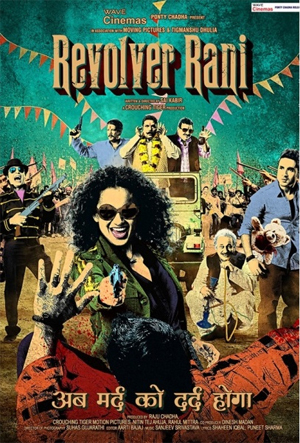 Kangana manages to be convincing as a trigger-happy dacoit though her performance suffers from an under-written role. The very talented Zakir Hussain, Piyush Mishra and Kumud Mishra also give their best in half-heartedly written characters. Surprisingly the weakest actor of the lot, Vir Das, gets the best defined role and he does an okay job. The songs don’t add much to the film, in fact the noisy background score actually takes away from it. It is difficult to forgive a film that dulls Kangana’s sparkle, especialy after Queen. All that fire going to waste. The potential of a biting satire, of an entertaining hinterland tale going to waste. Here’s hoping co-producer Tigmanshu Dhulia learns from this mistake and gives us the real deal in his next venture.